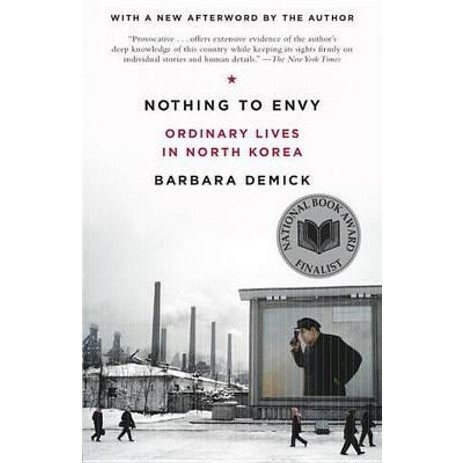 Nothing to Envy" "follows the lives of six North Koreans over fifteen years--a chaotic period that saw the death of Kim Il-sung, the unchallenged rise to power of his son Kim Jong-il, and the devastation of a far-ranging famine that killed one-fifth of the population. Taking us into a landscape most of us have never before seen, award-winning journalist Barbara Demick brings to life what it means to be living under the most repressive totalitarian regime today--an Orwellian world that is by choice not connected to the Internet, in which radio and television dials are welded to the one government station, and where displays of affection are punished; a police state where informants are rewarded and where an offhand remark can send a person to the gulag for life. Demick takes us deep inside the country, beyond the reach of government censors. Through meticulous and sensitive reporting, we see her six subjects--average North Korean citizens--fall in love, raise families, nurture ambitions, and struggle for survival. One by one, we experience the moments when they realize that their government has betrayed them.